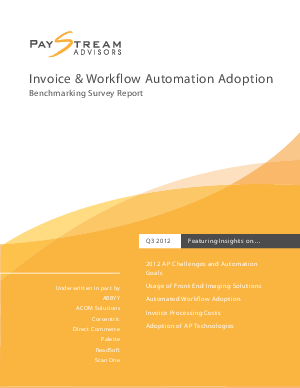 While paper still dominates as the number one method used to trade business-to-business invoices, there is a light at the end of the automation tunnel – paper is waning as more companies implement front-end invoice automation and automated workflow. In the past year alone, the use of paper to trade invoices has dropped ten percent (59 percent in 2012 from 69 percent in 2011). This trend will likely continue as more companies adopt electronic invoicing and automated approval workflow for invoices, the top two automation goals reported by accounts payable (AP) professionals in the 2012 Invoice Automation Adoption Survey.